David Wagner is the man responsible for coining the term “Daymaker” and launching what has fast become a movement. To share the philosophy that is the cornerstone of his life, David penned Life as a Daymaker: How to Change the World by Making Someone’s Day. In 1978, David attended Horst Education Center to become a hairstylist and eventually a successful salon owner before he discovered the power and importance of becoming a Daymaker. He came to a realization that just wishing the world would change wouldn’t affect anyone. David realized that the simplest act of kindness could make someone’s day and possibly even cause a worldwide ripple effect. 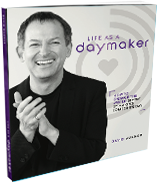 After a significantly inspiring moment of Daymaking, David wrote Life as a Daymaker. Since writing his book in 2002, David has been touring the world speaking at Fortune 500 companies, to students and at events in a variety of cities and industries annually addressing over 50,000 people to help spread his message about how to change the world by the intentional act of making someone’s day. David’s employees at Juut Salonspas strive to exemplify Daymaking everyday with every client they see. Juut also provides a copy of Life as a Daymaker to all first-time clients of Juut Salonspa. In addition to Daymaker and CEO of Juut Salonspas, the original AVEDA salons, David is a world-renowned hair stylist, artist, entrepreneur, and educator. He is also the husband to his wife, Charlie, and father to daughters Coco and Ava.